PCTPA Regional Bikeway Plan Update | Kittelson & Associates, Inc. Welcome to the PCTPA Regional Bikeway Plan Update online map. Share your ideas about how to make biking better in unincorporated Placer County. Your input will directly inform the recommended projects and programs to help improve biking and identify key regional bikeways for the Placer County Region. 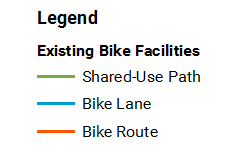 Note: An inventory of bikeway facility data is not maintained by PCTPA and is based on the best available local and regional data sources.